Vélo Vogue: CCC comes to SF! Mikael Colville Anderson, a.k.a. Zakkalicious, a.k.a. 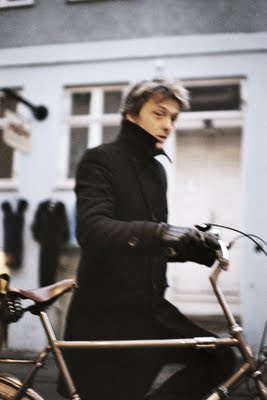 the Mac Daddy of Cycle Chic, makes a visit to SF this Friday! The 500,000 people who use bicycles each day in Copenhagen are not “cyclists,” nor are they “environmentalists.” They merely choose to ride because of safe, quick infrastructure. After 30 years of traffic and urban planning, the bicycle has become a democratic tool liberating Copenhagenites from cars and created the foundations for one of the world's most liveable cities. Speaker Mikael Colville-Andersen is Denmark's leading bicycle advocate, advising cities, towns and organizations about bicycle culture, infrastructure and urban planning with a unique focus on the anthropological aspects of getting more citizens to choose the bicycle. So get your fabulous on and get your bootie down there! You'll have to go and keep us all posted. That's a discussion that I'd love to be a part of.